Q: Russia said yesterday that its bombers recently flew over the airspace near the Korean Peninsula and that happened at a time when the US and the ROK were conducting joint military drills. How does China view the intention of Russia's action? Does China support it? A: I have noted the relevant report. As for Russia's considerations, I shall refer you to Russia. With regard to the current situation on the Korean Peninsula, we hope that all relevant parties can focus on promoting peace talks and the proper and peaceful settlement of the Korean Peninsula nuclear issue at an early date. We hope and welcome that all relevant parties can make efforts in this direction. Q: According to the report of the Reuters, on August 24, the Norwegian Minister of Trade and Industry issued a statement saying that Norway and China have resumed the negotiations on bilateral Free Trade Agreement (FTA). Can you confirm this and give us more details? 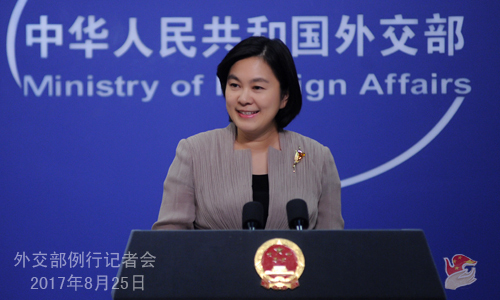 A: The ninth round of China-Norway FTA talks were held in Beijing from August 21 to 23. The resumption of the bilateral FTA negotiations is an important step to follow through on the consensus reached between the leaders of the two countries and it is of great significance to resume and enhance the bilateral pragmatic cooperation in economy, trade and other areas. We hope that the two sides can take this as an opportunity to move forward the bilateral relations. As for the detailed information of this round of negotiations, the Ministry of Commerce has issued the press release and you can refer to it. 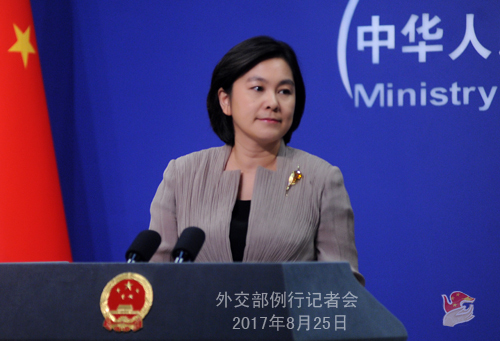 Q: The Japanese government announced today that it was going to impose unilateral sanctions on five Chinese companies and one Chinese individual that are related to the DPRK. What is China's response to this? A: The Chinese side always implements the resolutions of the UN Security Council in their entirety. Meanwhile, we are firmly opposed to the unilateral sanctions imposed by any country outside the framework of the UN Security Council, especially the sanctions against the Chinese entities and individuals. The Japanese side, in disregard of China's stern stance, goes so far as to follow some countries to impose unilateral sanctions on the Chinese enterprises and individuals. We are strongly dissatisfied with and firmly opposed to this. Japan's actions pose serious harm to China's interests and judicial sovereignty and create new political obstacle to the improvement of the China-Japan relations. The Chinese side demands Japan to immediately stop the relevant wrongdoing. If Japan persists in doing this, it must be responsible for the consequences. Q: The United States has arrested a Chinese national who is allegedly suspected of providing malware used for data theft from the US government employees. What is your comment? A: I have noted the relevant report and I am not aware of the detailed information you mentioned. I would like to reiterate that the Chinese government firmly opposes and cracks down on all forms of illegal cyber activities in accordance with law. This position is consistent and clear-cut. Meanwhile, the Chinese side always attaches importance to safeguarding the legitimate rights and interests of overseas Chinese nationals and provides needed consular protection and assistance for them.